Published in 1827, this two-volume work by the playwright and biographer James Boaden (1762-1839) is a sprightly portrayal of the acclaimed actress Sarah Siddons (1755-1831). Closely collaborating with his subject, Boaden (whose memoir of Dorothy Jordan is also reissued in this series) was able to establish himself as an authoritative biographer, preferred over others for his intellect and wealth of anecdotes from a lifetime spent within the theatrical world. Arguably the greatest tragic actress of her age, Siddons broke new ground in the reactions she provoked in audiences and in the social legitimisation of the English stage. Containing vivid descriptions of performances, this work details the acting style of Siddons and the inner workings of the theatrical community. 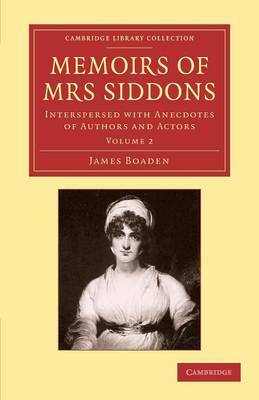 Volume 2 covers Siddons' most illustrious period, when she established herself as a cultural icon, from royal patronage in the mid-1780s and her celebrated Lady Macbeth, to her retirement in 1812 and occasional subsequent appearances.